>> What’s the Best Eyeliner for Eyelash Extensions? So, you’ve recently gotten lash extensions and you’re in LOVE with them! They look great, they make you feel great, and you’re loving the low-maintenance aspect of it. But once in a while, you miss the heavier makeup, and would like a good old swipe of eyeliner. Which leaves you with one question: what’s the best eyeliner for eyelash extensions? Can You Wear Eyeliner With Eyelash Extensions? A lot of women who get extensions don’t consider makeup necessary anymore – after all, they wake up “made up” every day. But some of us want a bit more than just lashes, and after all, makeup is about more than just looking pretty and polished; it’s about having fun and getting different looks. Especially if you’re used to your everyday winged liner, you shouldn’t have to go without it. So, the short answer is that yes, you can certainly wear eyeliner with lash extensions. With a lot of care, and some caveats that we’ll discuss more in a second. What to Look for in an Eyeliner for Eyelash Extensions? Ok, so you can totally wear eyeliner, that’s not the problem. The issue, here, is what kind of eyeliner. You don’t just want to put anything on your new extensions – no, you want to baby these new fluttery friends, which means you need an eyeliner safe for eyelash extensions. Certain kinds of eyeliners will work better than others, and we’ll tell you why. Liquid eyeliner is the most gentle on your extensions, because you’re literally painting it on. Whether you use a felt tip liner or a brush tip, the formula is liquid-y and gentle to apply, so you’re not disrupting your eyelashes or making them angry. Plus, even if you accidentally paint on your lashes, you can easily wipe away the excess. In addition, liquid eyeliner is usually easy to remove with just water. The other very important property an eyeliner (and any eye product) should have, when you’re wearing extensions, is for it to be washable. If a product is easy to wash off, the removal process will be more gentle on your lashes, as it will require no oils, no rubbing, and no harsh chemicals. Water should be sufficient. Sure, pencil eyeliner looks soft enough, but sometimes, you really have to apply pressure to get the pigment you want. In addition, oftentimes it requires you to really get in there at the root of the lashes and the tip of the pencil might simply be too firm and rough and dislodge the extensions and loosen the glue. It’s really best if you give the pencil a pass. We know what you’re thinking – but gel eyeliner is so gentle to apply! And it is. It’s soft and it’s easy to manipulate with a brush in the shape you want. It doesn’t really disrupt the lashes, so what’s the problem? Well, the problem is that the thick formula makes it very hard to remove. And while that’s great for longevity, it’s not that great for removal, when you’ve got extensions on. Gel eyeliner can take A LOT of scrubbing and oils, so it’s not really an eyeliner safe for lash extensions. We’ve touched upon this, but it bears repeating – waterproof products are a no-go when you have lash extensions. Not only do they usually require harsher removers, but the formulas are sometimes thicker with more waxes, which makes them more difficult to apply and remove. Oil is the no. 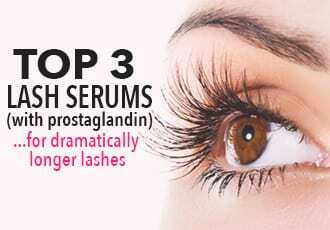 1 enemy of lash extensions, because it can damage the glue. That’s why the number one rule for finding the best eyeliner for lash extensions is that it must be oil free. 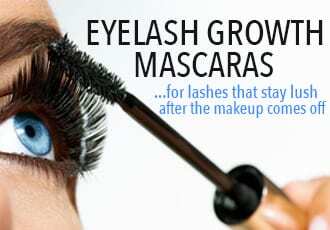 That goes for any products you use around the eyes – eyeliner, mascara, or makeup remover. It can be tricky to find products without it, so you’ve got to pay attention to that ingredient list. What About Removing Eyeliner On Lash Extensions? And since you have to be careful about how you apply eyeliner, you also have to be careful about how you remove it. 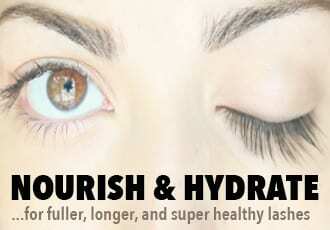 Want a more in-depth guide on how to clean eyelash extensions? Check it out. It’ll seriously help your new extensions last for ages. So What’s the Best Eyeliner for Lash Extensions? Okay, you say, that all sounds good and…complicated. Plus, who has the time to read through every eyeliner tube in order to identify oily ingredients? When it comes to choosing an eyeliner safe for eyelash extensions, Soap & Glory is an excellent brand, because not only is their aesthetic super cute, but their products smell incredible, are really high quality, and they come at drugstore prices. This oil free eyeliner is ideal if you want to obtain the perfect cat eye flick, because it’s super easy to use and it doesn’t contain oils, so it’s great for your extensions. In addition, it’s not impossible to remove, which means you won’t be there scrubbing forever. This also comes in an option with an even skinnier nub, so you can draw a more delicate line. All in all, an excellent choice that gets a thumbs up from us! A slightly more expensive option, bareMinerals is all about the mineral makeup and more natural ingredients, in general. This formula will allow you to draw an inky black line with no added oils, so your lashes are safe. Just like the one before it, this oil free eyeliner has a felt tip nib, so it’s extremely easy to maneuver and apply. It’s just a matter of swiping the pen across your lid and your eyeliner is ready and beautiful. And when it’s time for it to come off, just use a bit of micellar water. All in all, this one’s probably the best eyeliner for lash extensions, IMHO. We thought we’d throw in a super fun option too. Eyelash extensions are great, but you know what’s even better? GLITTER. Glitter liners are the easiest way to wear some sparkle, because there is no loose glitter involved and no glue – you just use it like you would a normal liner, to give your eye look a little bit of oomph. Just be a little more careful when you take it off – glitter has a tendency to get everywhere, so use that cotton bud tip we gave you! As you can see, getting eyelash extensions doesn’t mean you have to give up your eyeliner. It’s just a matter of finding the right one and treating your lashes right.